The Mexican Caribean is known for its vast variety of flora and fauna, a fundamental part of its beauty and equilibrium. Even though swimming with dolphins is certainly a must, today we would like to talk about the important impact Lionfish have on our ocenas. The Red Lionfish (Pterois volitans), is a species that belongs to the Scorpaenidae family, a group of fish that is characterized for having warning coloration with red, white, or black bands, showy pectoral fins, and protruding venomous spines. They are slow animals whose spines, that look very much like a mane, give the fish their name; Lionfish. They are carnivores that hunt primarily from late afternoon to dawn. Their hunting strategies consist of floating over its prey and then quickly attacking; or shooting jets of water to distract its prey and direct it towards its mouth. Females and Males are very similar; the female releases two egg masses, fertilized by the male before floating to the surface. Each mass contains upto 20,000 eggs! and they are thought to be coated with quemical substances that protect them against predators. After 36 hours the larvae begin to hatch. The Lionfish was first recorded in the Atlantic Ocean in 1985, specifically off the coast of Florida. Since then it has rapidly spread to the north, along the coast of North Carolina, and to the south along the Gulf Coast and Caribbean. The rapid and successful colonization of the Lionfish in this region is due to the favorable environment for its growth and reproduction, the spread of its young with the currents, the apparent lack of natural predators, and the absence of some parasites, that in its native habitat, control the population size. This has brought a serious ecological impact because the Lionfish feeds on fish, crustaceans and mollusks that have great value to the environment, the economy, and local culture. A recent study of the coral reefs off Bahamas, has shown that there has been a reduction of 65% of biomass within a 2 year period. The majority of the Lionfish’s prey are herbivores, which has resulted in a shift from a diverse coral community to one that is dominated by algae. The Lionfish has also been observed to compete with native species that share similar behavior, affecting the conduct, distribution, growth and survival of these. There is great concern about the impact this will have on the Mexican nature reserves, 8 of which have been affected so far. Investigate and monitor its biology, distribution and impact. Inform and educate local populations about the existence and impact of the species on the ecosystem. Capture the fish for either extraction or human consumption. It is important to know about the ecosystem that surrounds us, only then will we be able to understand the impact we have on it, and will we be able to find ways to actively involve ourselves in favor of these. Visit the Cancun Interactive Aquariumand see this and other species up close. 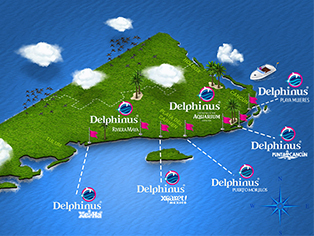 Reserve Now and enjoy the experience of swimming with dolphins in this habitat.